It’s like an aggressive Where’s Waldo picture. 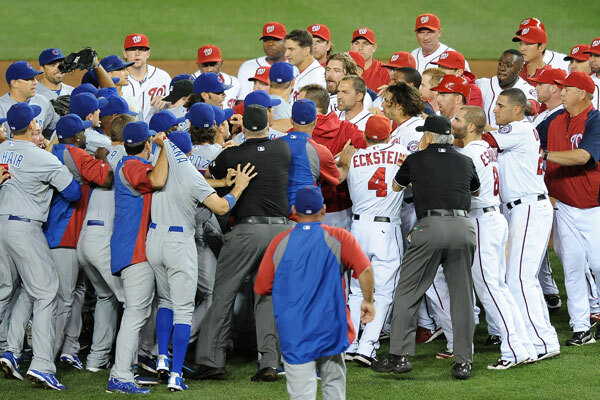 When the Cubs and Nationals “brawled” last week many fans immediately got on their high horses to give their opinions on the whole thing. And that’s fine. I, on the other hand, tried to get down as close as I could to the action so I could see what was going on. Baseball fights fascinate me. Most of the time it looks like a typical “guy fight” (some pushing, some shoving, a few crappy punches maybe, and a whole lot of yow-yowin’). The cause doesn’t interest me as much as who does what during the confrontation. Who’s first out of the dugout? Who leads the charge from the bullpen? Who’s playing peacekeeper? Who’s looking for a piece of the action. I must have watched this tiff forty times (and paused 140 times) to get an idea of what was going on. And since this bruhaha had two bench clearings and three separate altercations, there was a lot to see. -The Cubs in the dugout really weren’t paying much attention to Jamie Quirk yelling at Bo Porter. -When Bo Porter stopped at the top of the dugout stairs, the first guys to Dale Sveum’s side were Tony Campana, Luis Valbuena, Wellington Castillo, and Jeff Samardzija. -James Russell led the charge from the bullpen. -Darwin Barney and Starlin Castro strolled over to the confrontation. Alfonso Soriano and Brett Jackson hustled. -Jeff Beliveau peeking over the bullpen fence at the fuss cracks me up every time I see it. -Joe Mather, Campana, Travis Wood, Dave Sappelt, Samardzija, and Anthony Recker were first out of the dugout after Lendy Castillo went inside on Bryce Harper. -Russell again led the charge from the bullpen. Carlos Marmol and Manny Corpas were laughing and nudging each other as they ran in. Franklin Font runs pretty damn fast while wearing shin guards. -Corpas was part of the reason round three started. Anthony Rizzo tried to play peacemaker. -Russell, Samardzija, Recker, and Blake Parker were right on the front line. -Barney kind of got sucked into the crowd at one point, but they spit him out unharmed. Same thing happened to Rizzo. -Bryan LaHair was one of the peacekeepers. -A Nats player had a hold of the front of Samardzija’s jersey and was swinging from it like a monkey when everyone was doing their share of shoving and I’m not sure Shark noticed. -Dale Sveum and Dave McKay looked pretty calm throughout the whole thing. Pat Listach must have rowdy kids. He looked like a dad breaking things up. James Rowson was right in the thick of things, pulling guys apart and separating them. -Many of the guys had a look of “WTF?” on their faces. Those guys were more to the back of the most pit. Several players (David DeJesus was one) didn’t seem to get too excited. I was kind of impressed with the way the Cubs came together. Everyone answered the fight bell (okay, the second time Soriano jogged in, but he really needs to preserve his wheels) and while tempers flared, there were enough cooler heads to keep things from getting too out of hand. Everybody seemed to feel the need to protect his teammates. Nobody was left to hang. I appreciate that. Yes, I realize this is unpopular opinion. But then, isn’t every opinion I have about baseball/the Cubs unpopular? Yeah. Put away your surprise face.